Intelligence is very roughly correlatable with brain size. As humans evolved, brain size increased dramatically. The shape of the homind skull changes dramatically as well, to accommodate the development of a forebrain. The fossil evidence allows us to trace the gradual increase in brain size over the past two or two and a half million years with some degree of precision. The average brain size of Homo habilis, who lived approximately 2 million years ago, was 750 cc. 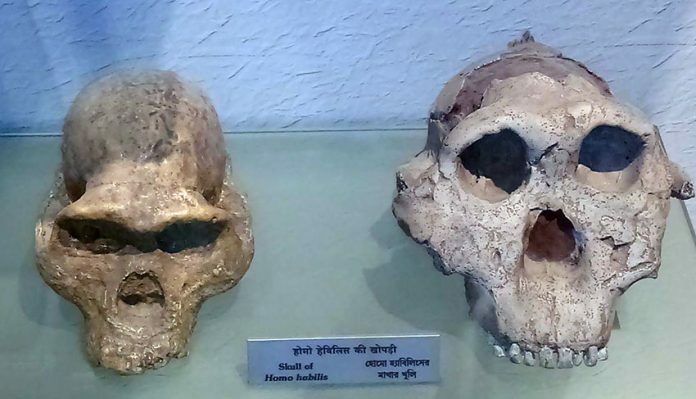 Homo erectus shows this transition most dramatically, indicating that most of the evolutionary increase in brain size took place during the life of this species. Early Homo erectus in Africa (from about 1.7 to 1 million years ago) averaged 900 cc in brain size, but later Homo erectus specimens from .5 million years ago average 1100-1200 cc, which falls within the range of the brain size of modern humans. The earliest or archaic forms of Homo sapiens, the species to which we belong, dates to 300,000-400,000 years ago and averages over 1200 cc. The Neanderthal skull has a brain size of 1500 cc, which is actually larger than the brains of most modern humans. The average for ourselves, Homo sapiens, is around 1400 cc. While there is rough correlation between brain size in relation to overall body size and intelligence, scientists caution that that correlation is very loose. Human brain size varies considerably, just as body size does. The brain size of recognized “geniuses” can vary from 1000 cc to 2000 cc in modern humans. Clearly, one has to examine far subtler features of the brain to understand the relations between physical characteristics and intellectual capacities or between brain physiology and social or cultural behavior. Surprisingly, a big brain is not an obvious evolutionary advantage, at least not immediately. For example, a large brain requires an inordinate amount of care and feeding a diet high in protein–and exquisite temperature control in order to function properly. Increases in brain size would therefore drive changes in early human diets, because of the need to increase the intake of protein. While human species remained ominivorous, a preference for meat-eating did in fact occur over time. About 25% of our metabolism is devoted to brain function, which represents a huge investment of energy–and therefore a huge risk in terms of the overall chances for survival of the species. Overheating the large human brain in the hot climate of east Africa was potentially fatal.